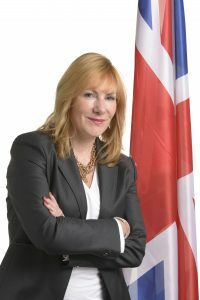 Outspoken MEP Janice Atkinson reveals the full, shocking extent of life inside the European Union, explains why she loves being labelled a populist by her political opponents, and gives Shy Society a rare insight into her personal dealings with Prime Minister Theresa May. Still struggling with the remnants of a winter flu bug, Janice Atkinson jovially describes her weekly commute, a journey to work perhaps like no other from the leafy suburbs of her family home in Kent to the bustling political hubs of Strasbourg and Brussels. “When you catch the Eurostar on a Tuesday or Wednesday morning, it is just absolutely full of lobbyists going over there from London – there’s an estimated 30,000 of them from Britain operating in and around the EU now – and we get daggers from them on every journey because of course it’s going to come to an end soon,” she explained. The South East England MEP, who now stands as an Independent, is adamant Britain’s referendum result was partly down to her fellow MEPs and the huge disconnect between the EU hierarchy and the people they purport to serve. “People don’t have a close relationship with their MEP and do you know why? None of them will put their head above the parapet. Can you even name any MEPs apart from maybe a smattering of UKIP people? If you ask people in the south east who their MEPs are they will say Nigel (Farage), Dan (Hannan) and Janice – the rest of them they won’t know. These people are not accessible and they are not accountable and I’m sure that, in a small way at least, contributed to Brexit. And while worryingly high unemployment rates still plague the southern European countries of Greece, Spain, Italy, Portugal and France, Janice describes a parallel universe in Brussels and Strasbourg where luxury and extravagance are part of daily life. “It’s a very nice place to work – you couldn’t wish for a better place, the medical facilities, the bars, no expense is spared for us. And nothing shocks you or prepares you for what you actually see,” Janice says. “You see the collusion that goes on – you sit in the chamber and it’s a big stitch up between the socialists and Merkel’s EPP and because the right, the alt-left and communists are fragmented, they have very little say on what goes on. It’s all a cosy consensus. “Personally I’ve only ever seen one lobby group and that was the Countryside Alliance because they had some particular concerns and I’m a big supporter of the countryside – but in general I’ve always refused to meet lobbyists. I won’t have my head turned but you can easily go to three or four parties a night in big restaurants and hotels. The champagne flows, fancy dinners are laid on by MEPs or NGOs, charities – I mean it is one big party town. It’s so far removed from reality and they’re not even used to this level of excess in Westminster. “I stood as a Conservative Party candidate in 2010 and still have loads of mates in the Tory party and they’re not wined and dined or lobbied even half as much as these MEPs are. The lobbyists know where the power is and the money has moved offshore. Janice now plays a leading role in the Europe of Nations and Freedom (ENF) group after parting company from UKIP in March 2015 amid controversy surrounding her expenses. No legal action was ever taken against Janice but her chief of staff Christine Hewitt did plead guilty to fraud and received a suspended jail sentence. With a steely determination in her voice, she explains how Brexit was the catalyst for far-reaching implications on the EU’s grip on power across the continent. “When I joined the ENF group it was a big shock to the system. They called us racists and xenophobes but actually we just laugh it off because on the right we’re generally quite jolly people –we’re comfortable in our skins and we’re nicer people. The left is such a hate-filled environment. And we like winding them up and just laughing at them. “About 18 months ago they started realising, with the rise of Alternative für Deutschland, the Swedish Democrats, Marine Le Pen and Geert Wilders, ‘oh no, people are actually voting for these people’ and they tried to discredit us yet again by calling us populists. We responded with ‘oh yeah, we like that term, because the Oxford English dictionary definition of a populist is somebody that represents the ordinary people’ so we wear that badge with pride. “I remember Nigel (Farage) turning to me one day and asking ‘do you like that term?’ and I said ‘you should embrace that term Nigel because, you know, our new best friend in the White House is also a populist. Embrace it, this is what it means’. However despite anti-EU parties growing in strength, Janice is notably less confident when it comes to our own Prime Minister’s attempts to negotiate an acceptable deal for Britain’s withdrawal from the EU. “I know Theresa May fairly well. We were part of something called Women2Win, which was a campaign to elect more Conservative women to Parliament. I was in the same group as Amber Rudd, Andrea Leadsom and Theresa May – who was ‘head girl’ and even back then she was a cold fish, even amongst other women. May would stand 20ft back from us and nobody was allowed to go near her or shake her hand. You’d ask her questions and she’d have that same shaky voice as she had in the 2017 General Election. HATE THE HATE CRIME LEGISLATION!